10 • E&MJ/Coal Age India 2016 Changing the Game way since his father founded it in 1954, initially producing bicycle tires for the Indian domestic market and later, tires for the heavier tricycle vehicles widely used throughout the country for public trans- portation. Output has risen from 10 metric tons per day (mt/d) to 600 mt/d and will grow to 800 mt/d by 2017. The company's product portfolio includes more than 2,400 SKUs—all OTR tires, as it doesn't make any products for on-highway applications. 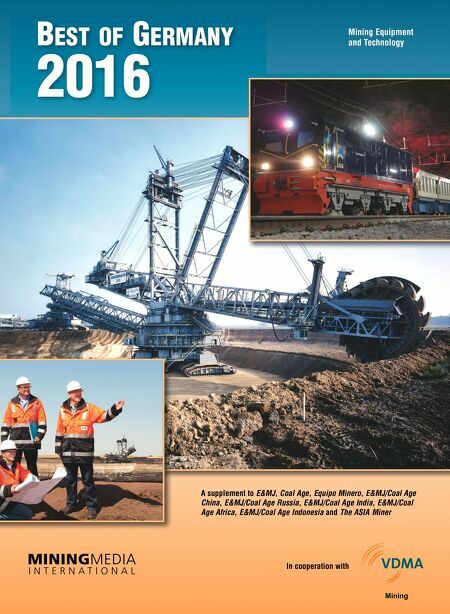 Its radial and bias-ply OTR lines include models for rigid and articulated haulers, wheel loaders, graders and several types of underground mining vehicles, as well as nonmining applications ranging from port equipment and cranes down to lawn and garden care utility vehicles. 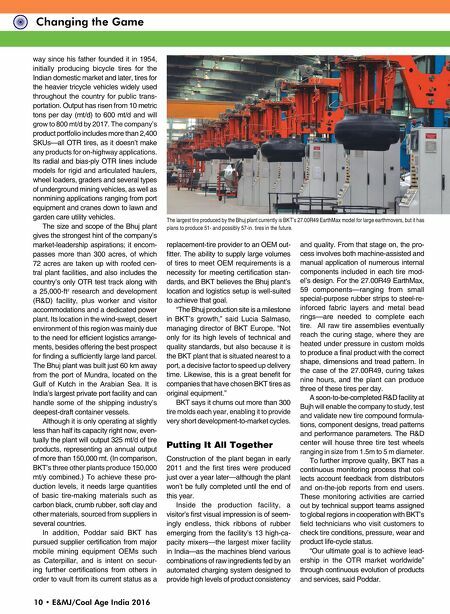 The size and scope of the Bhuj plant gives the strongest hint of the company's market-leadership aspirations; it encom- passes more than 300 acres, of which 72 acres are taken up with roofed cen- tral plant facilities, and also includes the country's only OTR test track along with a 25,000-ft 2 research and development (R&D) facility, plus worker and visitor accommodations and a dedicated power plant. Its location in the wind-swept, desert environment of this region was mainly due to the need for efficient logistics arrange- ments, besides offering the best prospect for finding a sufficiently large land parcel. The Bhuj plant was built just 60 km away from the port of Mundra, located on the Gulf of Kutch in the Arabian Sea. It is India's largest private port facility and can handle some of the shipping industry's deepest-draft container vessels. Although it is only operating at slightly less than half its capacity right now, even- tually the plant will output 325 mt/d of tire products, representing an annual output of more than 150,000 mt. (In comparison, BKT's three other plants produce 150,000 mt/y combined.) To achieve these pro- duction levels, it needs large quantities of basic tire-making materials such as carbon black, crumb rubber, soft clay and other materials, sourced from suppliers in several countries. In addition, Poddar said BKT has pursued supplier certification from major mobile mining equipment OEMs such as Caterpillar, and is intent on secur- ing further certifications from others in order to vault from its current status as a replacement-tire provider to an OEM out- fitter. The ability to supply large volumes of tires to meet OEM requirements is a necessity for meeting certification stan- dards, and BKT believes the Bhuj plant's location and logistics setup is well-suited to achieve that goal. "The Bhuj production site is a milestone in BKT's growth," said Lucia Salmaso, managing director of BKT Europe. "Not only for its high levels of technical and quality standards, but also because it is the BKT plant that is situated nearest to a port, a decisive factor to speed up delivery time. Likewise, this is a great benefit for companies that have chosen BKT tires as original equipment." BKT says it churns out more than 300 tire molds each year, enabling it to provide very short development-to-market cycles. Putting It All Together Construction of the plant began in early 2011 and the first tires were produced just over a year later—although the plant won't be fully completed until the end of this year. Inside the production facility, a visitor's first visual impression is of seem- ingly endless, thick ribbons of rubber emerging from the facility's 13 high-ca- pacity mixers—the largest mixer facility in India—as the machines blend various combinations of raw ingredients fed by an automated charging system designed to provide high levels of product consistency and quality. From that stage on, the pro- cess involves both machine-assisted and manual application of numerous internal components included in each tire mod- el's design. For the 27.00R49 EarthMax, 59 components—ranging from small special-purpose rubber strips to steel-re- inforced fabric layers and metal bead rings—are needed to complete each tire. All raw tire assemblies eventually reach the curing stage, where they are heated under pressure in custom molds to produce a final product with the correct shape, dimensions and tread pattern. In the case of the 27.00R49, curing takes nine hours, and the plant can produce three of these tires per day. A soon-to-be-completed R&D facility at Bujh will enable the company to study, test and validate new tire compound formula- tions, component designs, tread patterns and performance parameters. The R&D center will house three tire test wheels ranging in size from 1.5m to 5 m diameter. To further improve quality, BKT has a continuous monitoring process that col- lects account feedback from distributors and on-the-job reports from end users. These monitoring activities are carried out by technical support teams assigned to global regions in cooperation with BKT's field technicians who visit customers to check tire conditions, pressure, wear and product life-cycle status. "Our ultimate goal is to achieve lead- ership in the OTR market worldwide" through continuous evolution of products and services, said Poddar. The largest tire produced by the Bhuj plant currently is BKT's 27.00R49 EarthMax model for large earthmovers, but it has plans to produce 51- and possibly 57-in. tires in the future.